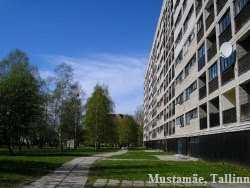 This was a revelation to me, such a nice block area so close to Tallinn, a satellite town. The name might not be that proper in English, but in Estonian, this has a very natural meaning: alvar. This word is used in another word 'loopealne' (https://en.wikipedia.org/wiki/Alvar) which means 'on top of an alvar' and 'Loo' came from this most probably. Wikipedia also has a nice overview photo of the whole town. This didn't look like as in use but actually it is: http://joelahtmekultuur.ee/lookultuurikeskus/et/. Black frames for windows make the house more interesting. On the other side of this path. A gem from probably 1960's where factories had such a nice architectural form. The sign says Factory of Limestone Products.